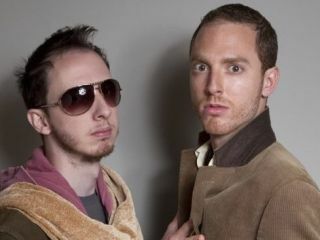 Nuclear O'Reilly: "A music duo disguised as male escorts for librarians". Following the news that The 88 recorded a complete song on the iPhone, New York duo Nuclear O'Reilly have upped the ante by producing what they claim is the world's first iPhone album. Phoning It In was created entirely using Intua Software's Beatmaker, a pad-based mobile production studio for Apple's handheld devices. "The freedom of this mobile studio app allowed us to create our newest music on the go: at friends' houses, parties, on the crosstown bus, and on the world famous A train, to name a few spots," say Nuclear O'Reilly (AKA Brad Naprixas and Jared DiDomenico). "And no, we're not an Apple or Intua street team disguised as a music duo, we're a music duo disguised as male escorts for librarians." You can watch a video documenting the making of Phoning It In below, while the album can be downloaded for free via Nuclear O'Reilly's website.